Originally from Brooklyn, New York, T.A. Noonan was raised in the South. She received her BA from Louisiana State University, her MFA from Florida Atlantic University, and her PhD from the University of Southern Mississippi. 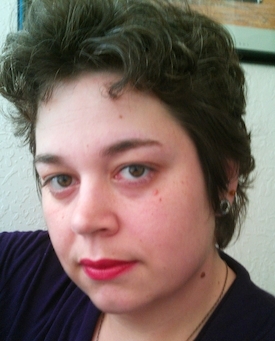 Her research interests include creative writing, independent publishing, new media, contemporary literature, hybrid and cross-genre texts, and pagan studies. She is the author of four sparks fall (Chicago Center for Literature and Photography, 2013), Dress the Stars (Dusie Kollektiv, 2013), The Bone Folders (Sundress Publications, 2011), Petticoat Government (Gold Wake Press, 2011), Darjeeling (Ahadada Books, 2008), and Balm (Flaming Giblet Press, 2006). Her poetry, fiction, nonfiction, and artwork have appeared or are forthcoming in publications such as Hobart, Ninth Letter, Verse Daily, RHINO, specs, Phoebe, and Harpur Palate. "The Trouble with Correspondence," her essay on the intersections of witchcraft and body image, was named a Notable Essay in Best American Essays 2011. T.A. also serves as Creative Consultant to the Sundress Academy for the Arts, Associate Editor of Sundress Publications, and Founding Editor of Flaming Giblet Press. Besides writing and editing, she engages in many artistic pursuits, such as graphic design, photography, bookmaking, and crafting. Although she professes a general dislike of Florida, she currently lives on its Treasure Coast with her partner, where she teaches writing and spends her free time cooking, playing video games, lifting weights, and avoiding sunburn. Great post! I have used time constraints in the past as a way to get out of writing ruts, and, while I may not write very well under pressure, it gets me out of the rut and actually working on something. Thank you for your comment, Miranda, and best wishes for your writing. Love this post! Constraints cause me to get out of my comfort zone of easy writing and produce something I normally would not have. Great advice in the last paragraph. Thank you for your comment. It is especially pleasant to have a constraint push us towards new areas! I once spoke with someone who read an article somewhere that criticized NaNoWriMo for encouraging writers to create a novel in a month and then rush it out to publishers; they argued the project encouraged quantity over quality. However, I think nothing could be further from the truth. Like you said, sticking to a regimen is hard and oftentimes life gets in the way. NaNoWriMo isn’t encouraging quantity over quality, nor is it encouraging writers to aim for publication as soon as November is over. It’s goal is get writers writing and complete step one of the process: finishing the first draft. It’s what you do beyond the month that starts to count and add up towards a great piece. Thanks for sharing this! Yes, Bianca! Writers know “real” writing begins with a “re” prefix: rewrite. What I think is so amazing about constraint writing is that it creates a completion which I know I sometimes struggle with. I can keep going and going adding more and more until I can’t remember what the story is about. But having only three days forces an ending whether it is great or not, it is there.